What options are available in fly line backing? You need the fly line backing to be really strong? Do colours make much of a difference? What is backing line made from? When setting up your fly fishing rod one of the pieces that often seems to get missed or not correctly applied is the need for proper quality fly line backing. Some anglers have just put the fly line directly onto the reel and wondered why they lost their fish after a short burst down stream. Others wondered why their fly line is sitting in coils on top of the water surface when it should be lying straight. Well I can tell you correct applied quality fly line backing will make for a more consistent cast and protect your rod and line from being broken by large fish that want to run. The need for backing line is plain to see, you need to allow fish to run when they want to and the usual 30 yards of fly line will not allow a fish to run especially if it is a large species. I have had fish run 200 yards hoping they will stop before they hit the end of the line and not being able to do anything about it. This is not going to happen with 30 yards of fly line the fish will hit the end and either the hook will pull out, the leader break or worse still the whole fly line getting pulled off the reel leaving you standing with no means to continue to fish not to mention the cost. The other need is to fill the spool up so your fly line is closest to the rim allowing for more line to be retrieved per turn of the handle. It also helps avoid those nasty coils in a fly line due to memory from being tightly wrapped around a small arbor reel. Its not so prominent now with large arbor reels but definitely is required with deep spools. There are several options when choosing fly line backing, thickness, breaking strain, color and material. Lets look over these to see the differences so we know how to use fly line backing correctly and how that affects our fly fishing. Thickness is straightforward enough, the thinner the line the more you can put onto the reel to help with the running fish scenario. Some gel spun lines come very thin with great strength and allow a lot of line to be run onto reels to help with this. However these gel spun lines are not cheap and running 300 yards onto a reel can cost you upwards of $20. Other lines include braided backing or dacron and mono braid backing lines. The mono option is usually the cheapest but as this line is also the thickest it means you get a lot less line on the reel. This is fine if you are only targeting smaller species like brook trout or perch but if you are after tarpon or pike then you may need a lot more than 100 yards of backing line on the reel. Now a days most reels come with info on the box as to how much backing they can hold but this is usually advised as the braided dacron type line so you need to reduce that figure somewhat for braided mono or increase when using gel spun lines. Reel on as much fly line backing as the reel will hold without being too tight and leaving room at the end to allow the reel to run freely. Then you want to remove it and place in loose coils to switch around so the backing goes on first and reel it all back on (make sure to stop and tie the backing to fly line knot correctly before completely running on the full line). This is a great way to get exactly the amount of backing onto the reel without over packing it. Breaking strain strength is again down to the species you are targeting. If its large 20kg plus then you will want to go for a stronger breaking strains than if targeting smaller species of say 1-2kg when 20lb backing will suffice. 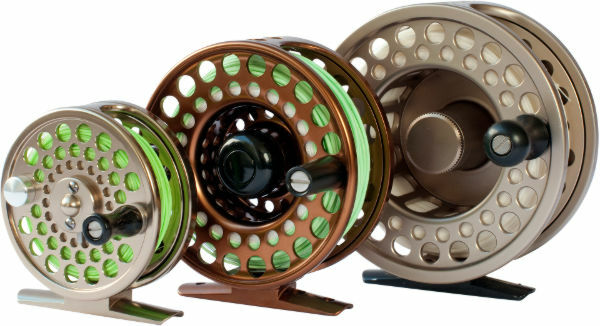 Bear in mind that the strength of the line will reflect on the diameter and how much you can spool onto the reel. As 40lb dacron will be much thicker but you will be probably be fishing with a 9-10 weight set up with a large arbor reel which can hold a few hundred feet plus your fly line. As its usually your knot that is the weakest link in the fly line set up. Fishing with a lighter breaking strain doesn’t need to be a problem as you can land large fish if you play them with proper attention if the knot is strongly tied. When they want to run let them and use the spring in the rod and tension control on the reel to allow for this. However putting on the appropriate backing line with the required breaking strain will minimise the stress and help you land a fish quickly especially if you are using the catch and release method and you want it to return to fight another day. Like all aspects to fly fishing backing fly line comes in a wide range of colours and there is no added advantage to using one colour over another. One thing I have noticed with sport fly anglers is putting length markers on the line so they can gauge how far a fish has run and how much line is left on the reel. This can be done by using a waterproof marker and marking the backing line every 50 or 100 yds. This can be fun to tell your mates that the last fish took off 150 yards of backing line on a mad dash for freedom. The material that backing line is made from now is quite varied. You can use plain braided monofilament which is cheap although bulky and abrasive or dacron which is braided using polyester or gel spun micro fibres of polyethylene which are very fine and strong. The last of these is the best as you can get a lot more on the reel as its strong and fine which allows for long runs by running fish. With this it is also the most expensive with 200 yards costing around $20-$30 with braided mono costing $3-$5 at most for 100 yards which is about all you would get on with a weight seven fly line on a seven weight set up reel. If you are only targeting small species like trout up to 2-3 lbs then the braided mono is ideal as its cheap and does the job however if going after larger species like salmon or pike then the gel spun backing line is the better option. I personally use all three with some of my trout set ups with braided mono or dacron and my salmon set up with gel spun. Whichever one you use make sure to add as much as possible to the reel to give yourself as much a chance to land that prized fish. The last piece of the equation is making sure the knot is correctly tied between the backing and the reel and the backing and the fly line. Having these two knots securely tied will ensure you don’t loose fish or worse your favourite fly line.